We're just settling back in to life in New Milford, after a crazy fun week of racing. 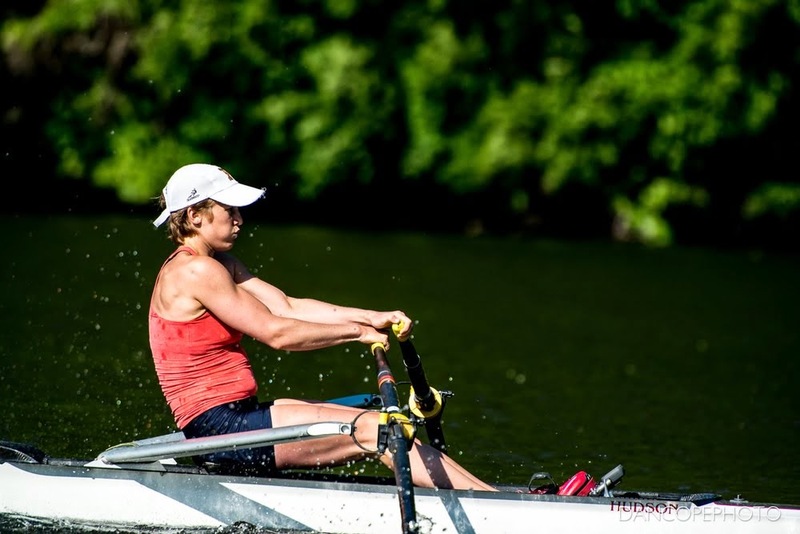 Last week, US Rowing held Senior World Championship Trials and the Elite National Championships at Mercer Lake in New Jersey. This was the first race for Trials. I raced former teammate Kristin Hedstrom and current teammate Sam Brecht. Top two progressed directly to Tuesday's semi-final. Despite nerves, everything went as expected—I had a solid race and did exactly what I needed to. Things played out about as expected across the other three heats, which the exception of newcomer Mary Maginnis. In her first race as a lightweight, she posted really fast times that got everybody talking. Semi-finals proved a tough battle for me. I faced off against Kate Bertko, Nicole Dinion and Laurissa Gulich. I had a great race and pulled my best time in the single, but Nicole managed to hold me off for the second spot in Wednesday's grand final. Despite not making the final, I was really happy with my performance. I've gained a lot of speed in the single already this summer, and it is really beginning to show. No racing! There was a time-trial scheduled for the evening for Nationals, but enough people dropped out of the regatta that it was cancelled. The twelve athletes were placed randomly into two heats for the morning session. Only the winner of each heat went directly to the final—everybody else went to an afternoon repechage. Tailwind conditions made for fast times, and I made one of my summer goals: break 8 minutes in the single! Emily Schmieg took the top spot, and sent the remaining 5 athletes to the afternoon repechage. I drew a mostly GMS rep, and had another outstanding race, almost hitting the 8-minute mark again, despite already-raced legs. Two races again! First up, the single. I'd let the results speak for themselves, but it would be as exciting. The first and second place crews were both Canadian, and therefore ineligible for our national title. That put me, unknowingly, in first place among American competitors! I'm the NATIONAL CHAMPION in the lightweight women's single!! As for my second race, I got an email mid-week asking me to jump into a lightweight quad that was missing a rower. It was only one race, it was after all of my single racing was done, and it didn't even require an additional weigh-in, so I decided to go for it. Our first row together was the race day warm-up, but it felt pretty great. And despite racing on tired legs and in a new boat and line-up, we managed to put together another really great race. Our time wasn't spectacular, largely due to windy conditions, but we managed to win another national title. Overall, it was a great learning experience. This holiday weekend, I head down to Philadelphia for another weekend of racing at the Independence Day Regatta. This is a much less formal regatta, but it's an opportunity to face off against some of the lightweight women I haven't raced much this season. If you or anybody you know is interested in sponsoring my trip to IDR or any future racing, please be in touch! You can reach me by email (lightweighteats [at] gmail [dot] com) or via social media.